For patient information, click on a category to the left, or use the search box above to find a specific subject. Alternatively, you can pick topics from our A-Z list below. 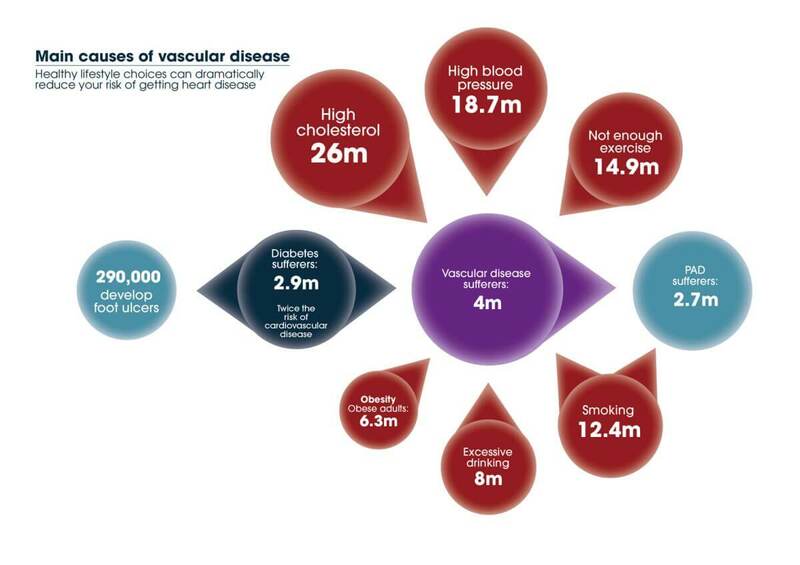 Vascular disease is caused by inflammation and weakness of the veins and arteries – and by the build up of fatty deposits in the blood vessels. 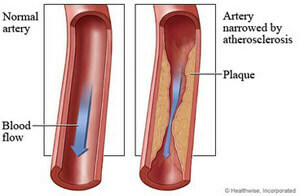 The accumulation of these deposits happens over a long period of time and can be virtually symptomless until the arteries and veins become so damaged, the blood flow to vital organs and muscles is compromised and causes lack of mobility, pain and tissue death. This infogram illustrates all the risk factors - most of which you can reduce! To minimize your risks, follow our hints and tips for a healthy diet and active, healthy lifestyle online, or download a PDF for ongoing reference to help you change bad habits and improve your vascular health. We have more information on the circulatory system, ways of preventing vascular disease and we also have detailed information on specific types of vascular disease and their treatments, as listed on the left of the screen. You can view information online, email it to someone you know or download a PDF. You can also request delivery of printed information by post, using our information order form. The NHS Choices website is the biggest health website in the country, providing both patients and healthcare professionals with a wide range of high quality health information. NHS Choices is a certified member of the Information Standard as a producer of reliable health and social care information. Counselling Directory is a counselling support network across the UK, enabling those in distress to find a counsellor appropriate for their needs located nearby. This is a free, confidential service that provides information to those in distress. Every counsellor on the site is registered with a professional body with recognised codes of ethics and practice or has certified qualifications.